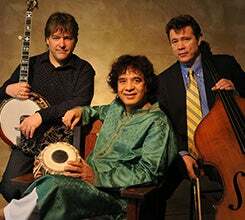 Masterful genre-benders and the leading virtuosos on their respective instruments, Béla Fleck, Zakir Hussain, and Edgar Meyer move with ease among the worlds of classical, bluegrass, and world music. Three of the most limitless creators and composers in the history of music, Fleck, Hussain, and Meyer touch every geographical and stylistic corner of the musical world. Béla Fleck has been called the premier banjo player in the world and has virtually reinvented the image and the sound of the instrument. He has won 15 Grammy® Awards and has been nominated in more different categories than anyone in Grammy history. 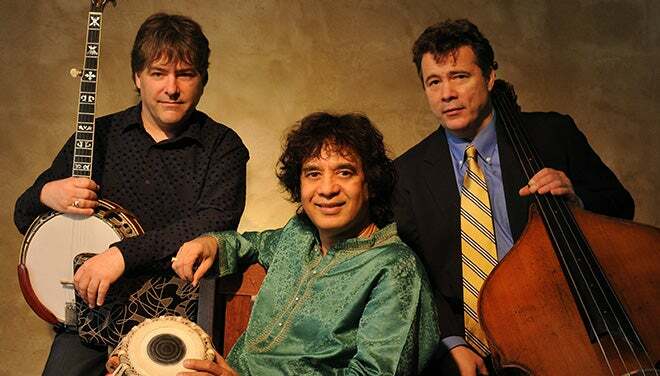 A classical tabla virtuoso of the highest order, Zakir Hussain is widely considered a chief architect of the contemporary world music movement. This Grammy Award winner won the 1999 National Heritage Fellowship - the United States’ most prestigious honor for a master in traditional arts. Hailed by The New Yorker as “…the most remarkable virtuoso in the relatively un-chronicled history of his instrument,” Edgar Meyer is in demand as both a classical bassist and composer. In 2011, Meyer joined cellist Yo-Yo Ma, mandolinist Chris Thile, and fiddler Stuart Duncan for the Sony Masterworks recording The Goat Rodeo Sessions, which was awarded the 2012 Grammy Award for Best Folk Album. Grab your drum and play along or come and watch a master tabla player up close with the World Percussion workshop with Zakir Hussain. Grab your banjo and strum along or come to watch the Banjo workshop with Béla Fleck. Contact the Peace Center Box Office at 864.467.3000 to hold your seat. Save on tickets with a group of 15 or more! Call 864.467.3032 or email [email protected] to order.